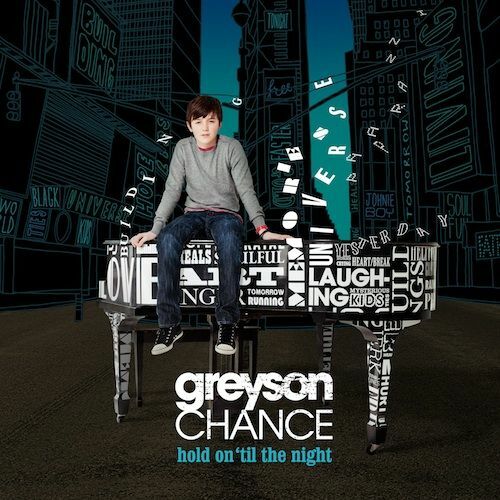 I was thrilled when I got my advance copy of Greyson Chance’s debut album, Hold On ‘Til The Night. We’ve already heard some of his stuff, but I was dying to hear a complete album, wondering how many of the tracks I’d actually like, and which would be my favorite. Well, let me just tell you that I can’t stop listening to it, and I am not skipping over any of the songs. They are all great. I am completely blown away by this kid. Honestly, Justin Bieber should be worried. Greyson’s voice is mesmerizing. If I had to pick my two favorites off the album, I’d have to say the opening track, Waiting Outside The Lines and the title track, Hold On ‘Til The Night are the winners. But then Home in Your Eyes…. OMG…. I love all of them! You can pre-order your copy of Hold On ‘Til The Night now, at Amazon….. and you’re insane if you done buy it….. The album is set to release on August 2nd. Don’t miss out!